Dangerous Trend in Des Moines! Due to a scheduling conflict last week, Stand-Your-Ground legislation wasn’t filed last Thursday, but will be filed today instead. That means you have one last chance to contact the members below who have not yet cosponsored this legislation but have promised to do so or have done so in the past. It’s critical that you do. 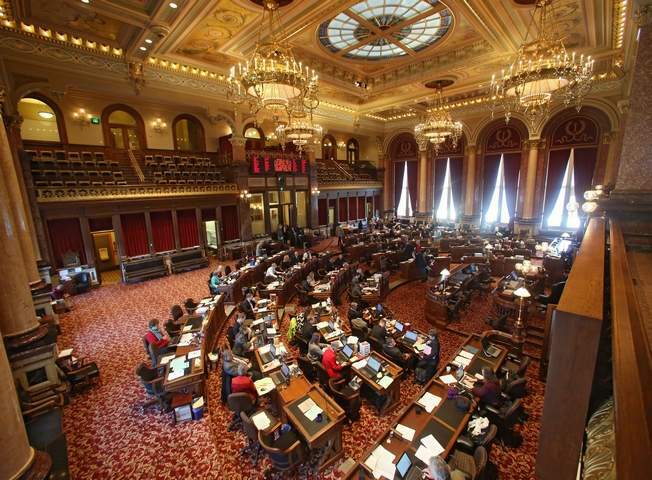 Gun owners fought tooth and nail to secure a pro-gun majority in the Iowa legislature last fall, for exactly this reason — to pass Stand-Your-Ground and Constitutional Carry in 2017! Gun owners did their job, it’s time the legislature does theirs. That starts with cosponsoring this legislation, as dozens of legislators already have. As of this morning, here’s the list of Senators who have cosponsored: Senators Anderson, Behn, Breitbach, Brown, Chapman, Chelgren, Costello, Edler, Feenstra, Guth, Johnson (Craig), Johnson (David), Kapucian, Kraayenbrink, Lofgren, Rozenboom, Schultz, Segebart, Sinclair, Smith, Zaun, and Zumbach. Senator Schneider informed us late last week that he was officially adding his name on as well. Assuming that he did so over the weekend, and with Senator Bertrand as the sponsor — we’ve got 24 cosponsors. This is a strong showing, thanks to all of your calls and emails. But we still have a number of legislators who are simply refusing to back this crucial legislation. They only have a few hours left to cosponsor! So please take a moment, one last time, to contact the Senators listed below and insist that they cosponsor right away! Some of these legislators are reporting to you that they aren’t willing to cosponsor because Stand-Your-Ground will be wrapped into the upcoming omnibus gun bill and they intend to support that. But gun owners should be extremely wary here. As IGO members will recall, for the past two years we’ve had to publicly oppose the omnibus gun bill because of all the horrible policy setbacks embedded in the bill! That’s right, while the bill did many good things, for the last few years it also contained a “wish-list” for anti-gunners — in a naïve attempt to curry their favor. Of course, we’re not interested in currying favor with anti-gun legislators. We’d much rather expose them in their districts and let gun owners boot them out of office, as we’ve done for years. But multiple capitol insiders are reporting to us that, despite having been given a pro-gun majority by gun owners, House leadership may add these same “poison pill” amendments to this year’s omnibus gun bill. >>> New “gun free zones” in all 99 county courthouses in Iowa, by allowing rogue judges the ability to simply declare county courthouses as off limits to gun owners. While the final draft of this legislation isn’t finalized and could still be changed, this current draft is an outrageous betrayal of gun owners that has my blood boiling! Insiders are reporting to us that the database provision, known as the “Sodders Amendment,” is a little gift to the notoriously anti-gun ISSDA, the Iowa State Sheriffs’ and Deputies’ Association. Further, the “Gun Free Zones” language is reportedly being demanded by the Trial Lawyers Association. Specifically, the lawyers in the House GOP caucus are reportedly demanding this, as a condition of their backing the omnibus bill! THAT is why we are pushing for clean, stand-alone language for both Stand-Your-Ground and Constitutional Carry law! And that’s exactly why you need to demand that the Senators listed below cosponsor this bill before it’s filed later today. Gun owners delivered in a major way last fall. They pounded the streets for pro-gun candidates knocking on doors, they donated their money, they helped stuff mail, and they cast their vote –- all to see Stand-Your-Ground law become a reality in 2017. So we aren’t going to sit back now and let the House leadership team stab gun owners in the back by undermining this bill — all to curry favor with the anti-gun ISSDA and the Trial Lawyers Association! They want your help in the election season, of course, but now that it’s time to pass the bills, they want to do it in secret. That’s why there’s no version of this bill available for review. We hope that we’re wrong. We hope that the House leadership team proves us incorrect. But this has been going on for two years now, and we’re hearing too many reports now in the Capitol to ignore this any longer. That’s why I hope that after you contact the Senators listed above, you’ll also take a moment to contact your Representative as well. This bill is going to start in the House, and it may become finalized at any moment. Remind him of what a potent force gun owners continually prove themselves to be, and remind him that you’ll be watching to see what he does when this bill hits the House floor. To find out who your legislator is and to obtain contact information, please click here. Finally, when you’re done, please feel free to support the work of Iowa Gun Owners by chipping in $10 or $20 right away! Either way, please contact your legislators immediately, that’s most important! P.S. With Stand-Your-Ground law being filed today, it’s important you contact the Senators listed above one last time, and insist that they cosponsor this bill. It’s all the more important now, as we’re learning more about the omnibus bill that Stand-Your-Ground law will likely be attached to. This omnibus bill may contain the dreadful “Sodders Amendment,” which creates a database of every Iowan with a carry or purchase permit. More, this omnibus bill will reportedly allow rogue judges to make deadly “Gun Free Zones” out of Iowa’s 99 county court house buildings! That’s why we need clean legislation! So urge the Senators listed above to support the Bertrand Stand-Your-Ground bill. Finally, please support the work of Iowa Gun Owners with your most generous contribution today!